Many years ago, when I was living in a small apartment complex in East Austin, I had a downstairs neighbor from Japan who fixed this incredible omeletty-fishy-pancake-y thing for dinner for me and a few of her friends. She served it with this wonderfully tasty sauce that I had never had before that really brought out all of the flavors of the pancake. It was one of the most delicious things I had ever tasted. But when I asked her what it was, she got a funny look on her face and avoided answering my question directly. She kept saying it was no big deal, just something she threw together. But it was good enough that I really wanted to know, so I wouldn't let it go, which was probably rude of me. She finally said, with obvious embarrassment, that it was something you cook for the family and not something you usually offer guests. With even more embarassment, she confessed that the sauce was a mixture of mayonnaise, ketchup and soy sauce. And she finally told me the name of it, but I just couldn't keep it in my head. All I remembered was that it sounded like "economy" with a couple of syllables after it, and that was the best I could do. But while I could not for the life of me remember the name of it, I never forgot that wonderful dinner. Any time I found myself at a Japanese restaurant I would search the menu, hoping to find something that sounded even remotely close to what little I remembered of the name, but I never saw anything like it. And then, in that odd way life has of giving you answers long after you have stopped asking the questions, and in the last place you would expect, I was reading Edward Espe Brown's Tassajara Bread Book to learn how to make bread. After reading his most excellent section on the zen of bread, I read on through the other recipes at the end of the book. Imagine my surprise when I ran into a recipe for something called "Okonomiyaki," which he described as "Japanese pancakes made with vegetables (and meat)." And that quickly, my search ended. Not only did I know what it was called, I now had a recipe! 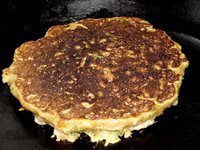 Okonomiyaki literally means "cook what you like." It is popular in Osaka and Hiroshima, where there are many restaurants that feature it. This is not an authentic Japanese recipe, but it does the job for me. As an added bonus, the mayonnaise I used for the sauce was home-made. 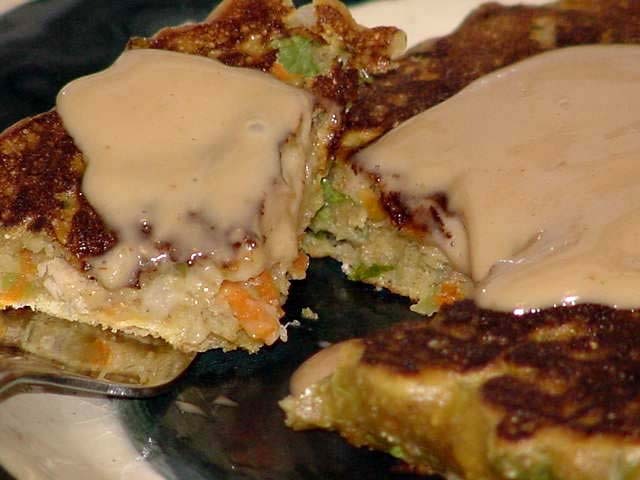 The beauty of this pancake is its versatility--you can have it for lunch, dinner, or even breakfast. You can even freeze them. Here's what it looks like when you're cooking the first side. And after it's been flipped. Mix flour, egg, brown sugar, salt, and evaporated milk to form batter. Add water to make pancake consistency. Fold in vegetables. Pour out enough for 6-8" cakes and cook on griddle or cast-iron skillet over medium-low heat for approximately 8 minutes on each side, or long enough for vegetables to cook. Use 2 spatulas to flip. Check frequently to make sure it's not burning. Add more water to keep batter thin, if necessary. Mix together and spoon over okonomiyaki. *I use a 6-ounce can of salmon or tuna. I have been using carrots and celery quite a bit, and while I have no trouble using up the celery, sometimes it's hard for me to use up all the carrots. 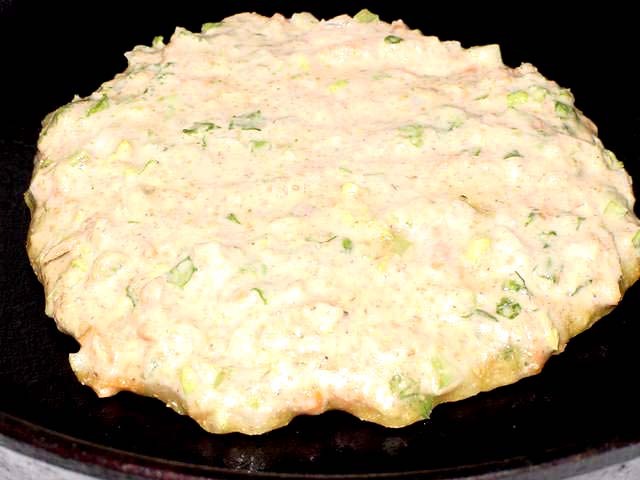 I was looking for something new to make with them when I remembered Okonomiyaki, which I haven't made in years. I also have 6 ounces of pressed tofu in the fridge for some stir fry, so I knew I would be needing some vegetables for that, so I figured I can use the rest of the cabbage and some of the celery in the stir-fry. There is a great character in the Ranma 1/2 anime series who is a girl that runs a okonomiyaki stand. She uses little versions of the flipping paddle as throwing knives. You could so be her. Yeah, I ran into her when I was doing some research. I'd love to see it, but I don't know if it could compare to the image I have in my mind! I've never seen the flipping paddles--I just use two spatulas. Yes, as you like it for the hilarious items, the success rate would become sound and long reaching for the people. The formation of the better cloths and cheap essay writer has been ensured for the punctuation of the things and ideas for the humans in life.